As teachers grapple with the challenge of a new, bigger and more challenging school curriculum, at every key stage and phase, success can feel beyond our reach. But what if there were 50,000 small solutions to help us bridge that gap? In Closing the Vocabulary Gap, Alex Quigley explores the increased demands of an academic curriculum and how closing the vocabulary gap between our `word poor' and `word rich' students could prove the vital difference between school failure and success. This must-read book presents the case for teacher-led efforts to develop students' vocabulary and provides practical solutions for teachers across the curriculum, incorporating easy-to-use tools, resources and classroom activities. Grounded in the very best available evidence into reading development and vocabulary acquisition, Closing the Vocabulary Gap sets out to:help teachers understand the vital role of vocabulary in all learning; share what every teacher needs to know about reading (but was afraid to ask); unveil the intriguing history of words and exactly how they work; reveal the elusive secrets to achieve spelling success; provide strategies for vocabulary development for all teachers of every subject and phase. 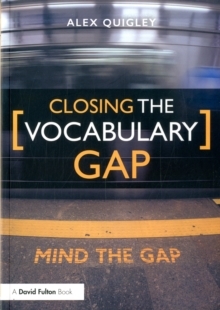 With engaging anecdotes from the author's extensive personal teaching experience woven throughout, as well as accessible summaries of relevant research, Alex Quigley has written an invaluable resource suitable for classroom teachers across all phases, literacy leaders and senior leadership teams who wish to close the vocabulary gap.